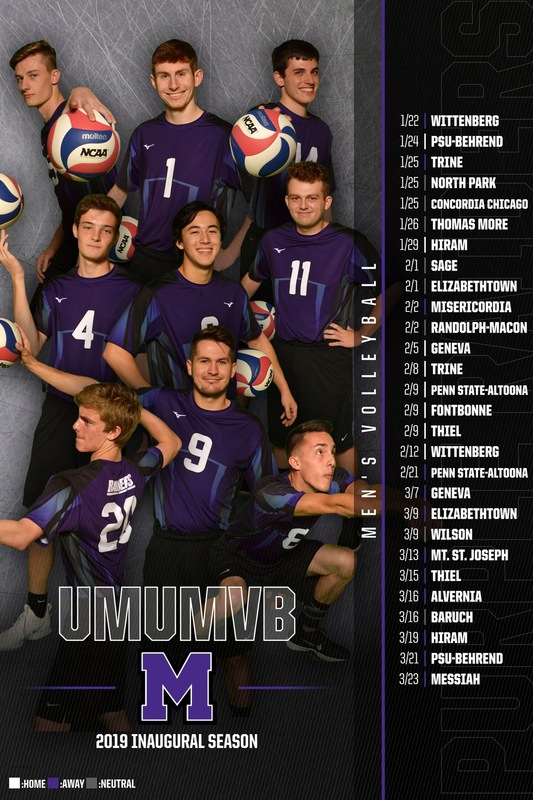 ALLIANCE, Ohio -- The Mount Union men's volleyball team fell to Penn State-Behrend, 3-0, in their home opener at the McPherson Academic and Athletic Complex Thursday night. Freshman opposite hitter Mark Bruns (Columbus/Upper Arlington) led the offense for the Purple Raiders (0-2) with five kills. Most of Bruns' kills came off of freshman setter Jeremy Leyden (Cuyahoga Falls/Archbishop Hoban) as he collected 14 assists on the night. Defensively, Bruns and sophomore libero Andrew Chen (Brooklyn City, Minn./Park Center Senior) each had three digs. At the net, sophomore outside hitter Justin Sibbel (Stow/Stow-Munroe Falls) chipped in a pair of solo blocks. Reigning Allegheny Mountain Collegiate Conference champions, Penn State-Behrend (1-0) began the first set with a commanding 5-0 lead. A pair of kills from Bruns and senior outside hitter Jordan Spurling (Columbus/Groveport Madison) kick started the Mount Union offense in effort to chip away at Behrend's lead. Behrend's hitters would not back down as they were able to extend their lead to its largest at 18-5 before going on to win the first set, 25-13. Behrend came out strong again in the second set on a 7-0 service run by Josh Matthews. The Raiders were able to get within five points at 11-6 after a kill by freshman middle hitter Sam Matonis (Macedonia/Walsh Jesuit) and an attack error by Behrend but it would not be enough to hold off the Lions as Behrend closed out the set on a 14-3 run, winning 25-9. Final set, a solo block by Sibbel followed by a kill from Kaleb Krebs (Pittsburgh, Pa./Seton LaSalle) gave Mount Union their first lead at 2-1. Behrend went on a 6-0 service run supplied by Dillon Hildebrand was enough to get the offense moving as Behrend's lead was eventually extended to 21-9. The Raiders were able cut it to nine at 21-12 but Behrend ultimately walked away with the win at 25-14.